Cheetah c550 GPS speed camera detector provides speed camera warnings in the UK, Europe, USA, Canada, Australia and New Zealand (subscription charges apply). The Cheetah c550 alerts to speed and red light cameras. You can change the alert range on the c550 for each speed camera type (read more below). The screen features a proximity bar and you will be able to view a countdown on screen in metres. Cheetah c550 also provides audible alerts. The alerts can be muted or turned off. In dark conditions you set the screen not to dazzle you. You can also set the threshold of alerts to sound only when driving a percentage above the speed limit. Subscription is required for the Cheetah c550 to alert you to speed cameras in your vehicle and starts at £19.99 for 3 years, read more about Cheetah c550 subscription. The Cheetah c550 GPS speed camera detector provides speed camera warnings in the UK, Europe, USA, Canada, Australia and New Zealand (subscription charges apply). The alert range ranges from 100 metres to 1000 metres and the alert range can be manually set for each type of speed camera (read below for more information). There is also an overspeed warning for a user-defined pre-set speed. Both speed cameras and red light cameras will be alerted to. Unlike other speed camera detectors the Cheetah c550 is compatible with an external GPS antenna allowing you to locate the main unit away from the windscreen by connecting to the external GPS antenna and locating the antenna in the window with a view of the sky to receive a GPS signal. When approaching a speed camera you will receive an overspeed warning if you are driving above the speed limit for the road. A final chime will sound when you are passing the speed camera. 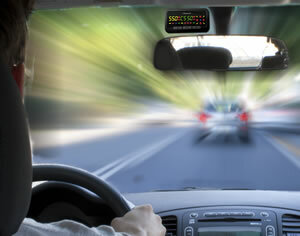 When driving above the speed limit at a speed camera location your current speed on the display will start to flash. You will also receive a countdown to every speed camera on screen whereby the clock will change to a distance countdown in metres. There is also a proximity bar that also counts down to the speed camera location. On screen information also identifies the speed camera type. 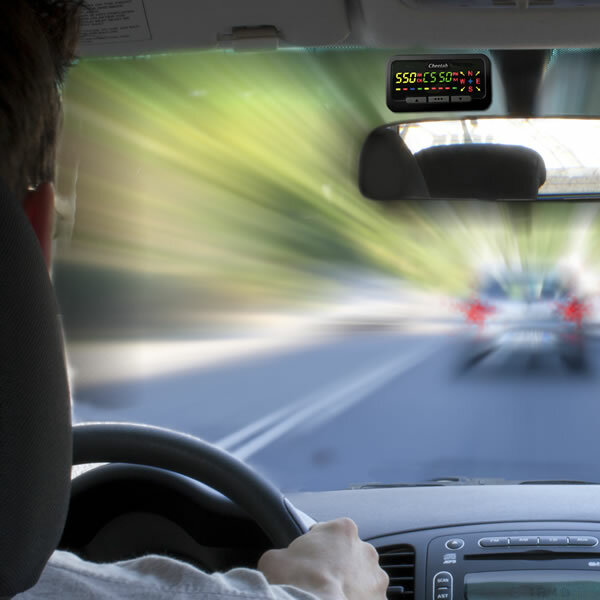 Spoken voice alerts tell you exactly what the look out for at each speed camera location. For example the spoken voice will say "at the traffic lights", "on the overhead gantry", etc. 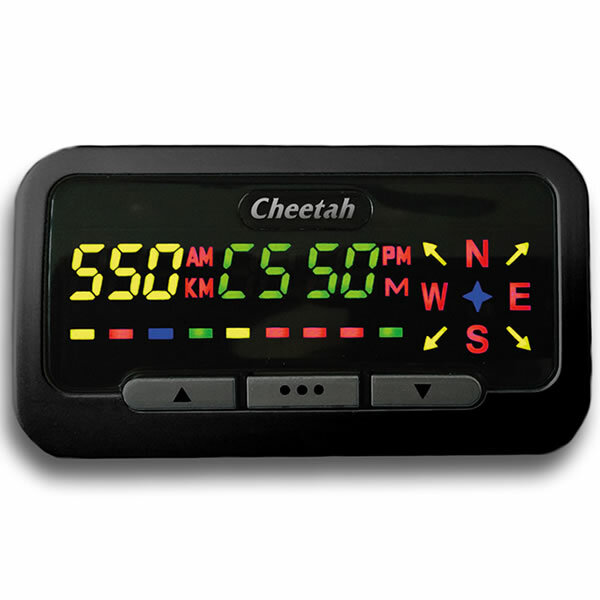 No false alerts will be received when using the Cheetah c550. You can mute and cancel alerts completely if you choose to. This may be useful when you are driving a familiar road and you do not require full audible warnings to speed cameras. When driving in dark conditions (i.e. at night) you can set the Cheetah c550 screen to dark mode whereby the screen will not dazzle you. Whisper mode will make the audible alerts quieter than normal. The speed limit that triggers an alert to you is adjustable using the speed tolerance feature. For example, if you set the tolerance to 5% when driving on a 40MPH road you will not receive an overspeed warning until you are driving at 42MPH. You can add up to 64 of your own preset locations to be warned of. This is useful when you want a countdown to particular locations. Simply set your pre-defined location(s) and the Cheetah will alert you to them. The Cheetah c550's Trinity 3.0 database features speed camera locations and red light cameras. The Trinity 3.0 database can be updated using a PC computer running Windows Vista, XP, 7, 8 or 10. You can get access to the latest speed cameras as often as you like and if you forget you will be reminded if you do not update within a 6 week time frame. ‣Speed cameras: OFF, 300m, 400m, 500m, 600m, 700m, 800m, 900m. ‣Stored mobile cameras and mobile zones: OFF, 300m, 500m, 700m, 900m, 1000m. ‣Average speed cameras and average speed zones: OFF, 300m, 400m, 500m, 600m, 700m, 800m, 900m. ‣Average speed exits: OFF, 100m, 200m, 300m, 400m, 500m, 600m. ‣Safety locations: OFF, 300m, 400m, 500m, 600m, 700m, 800m, 900m. ‣School zones**: OFF, 100m, 200m, 300m, 400m, 500m, 600m. ‣Information locations: OFF, 300m, 400m, 500m, 600m, 700m, 800m, 900m. ‣Red light cameras: OFF, 100m, 200m, 300m, 400m, 500m, 600m. ‣Non-ticketing cameras: OFF, 300m, 400m, 500m, 600m, 700m, 800m, 900m. ‣Cameras in tunnel: OFF, 300m, 400m, 500m, 600m, 700m, 800m, 900m. ‣Personal locations: OFF, 100m, 200m, 300m, 400m, 500m, 600m. ‣Opposite direction alerts: OFF, 100m, 200m, 300m, 400m, 500m, 600m. ‣Highway cameras: OFF, 500m, 600m, 700m, 800m, 900m,1000m. Do you have a question about the Cheetah c550 that's not been answered on this webpage? Please see our speed camera detector FAQs for questions from other customers and visitors. Plus if the answer to your question isn't featured, use the online form to ask us for the answer. Alternatively please telephone 01733 777623 Monday to Friday (9:30am-5:00pm) to speak to one of our sales team. The Speed Cheetah c550 includes windscreen and dashboard mount for simple and easy installation either on your windscreen or on the dashboard. Recommended places to install the Cheetah c550 is in the top, middle part of the windscreen just under the rear view mirror. 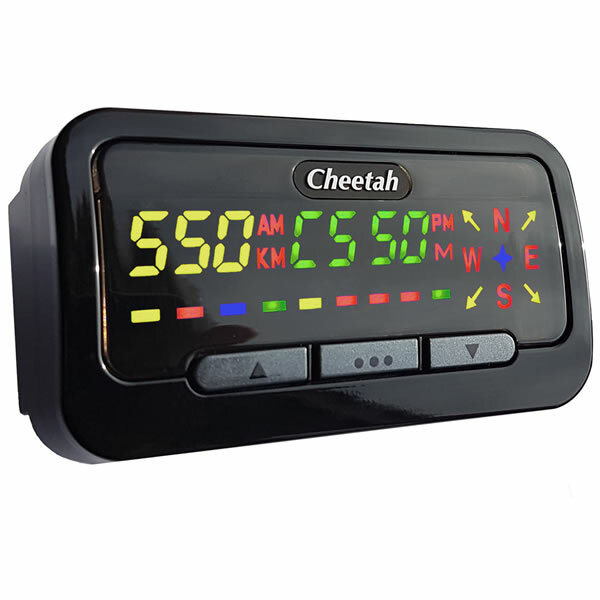 To increase the visibility of the screen of the Cheetah c550 you may choose to locate the Speed Cheetah c550 on the dashboard instead. There is an option to buy an external GPS antenna which enables you to locate the speed camera readout unit away from the dashboard as when using the external GPS antenna it will not need to have a view of the sky (only the GPS antenna will need to receive the GPS signal). 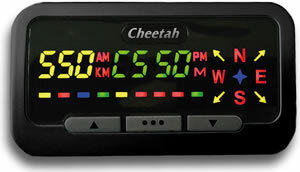 The Cheetah c550 available to purchase from this webpage does not include any speed camera subscription. The subscription options are below. However, we also sell the Cheetah c550 Platinum Edition which includes unlimited lifetime speed camera updates/subscription for all regions - Region ONE, TWO and THREE - please see coverage below. There is nothing further to pay to subscribe to the Trinity 3.0 database when purchasing the Cheetah c550 Platinum Edition from ActiveGPS. View and buy the Cheetah c550 Platinum Edition. GOLD membership: £19.99 3 years subscription for a single region. Regions include: 1. UK and Europe, 2. USA and Canada, 3. Australia and New Zealand. PLATINUM membership: £34.99 Lifetime unlimited subscription for all regions Can be used with up to 3 family owned Cheetah speed camera detectors. Please note: GOLD and PLATINUM memberships are payable directly to the manufacturer once your Cheetah c550 has been delivered to you and your serial number known. Region ONE - United Kingdom (UK) and Europe: UK: England, Northern Ireland, Scotland and Wales. Please note: Republic of Ireland locations are included in both the UK and Europe datasets. Europe: Andorra, Armenia, Austria, Belgium, Bosnia and Herzegovina, Bulgaria, Croatia, Cyprus, Czech Republic, Denmark, Estonia, Finland, France, Germany, Greece, Hungary, Iceland, Ireland, Israel, Italy, Latvia, Lichtenstein, Lithuania, Malta, Netherlands, Norway, Poland, Portugal, Romania, Russia, Serbia, Slovakia, Slovenia, Spain, Sweden, Switzerland, Turkey, Ukraine. IMPORTANT: It is fully legal to use, own and operate a speed camera detector in the UK. However, before using the Speed Cheetah c550 outside of the United Kingdom we STRONGLY RECOMMEND that you check to ensure that the use of a speed camera detector in other countries is also legal. The Trinity 3.0 database can be updated using a PC computer running Windows Vista, XP, 7, 8 or 10. Please note: The Cheetah c550 is not compatible Apple Macintosh operating systems. Looking for accessories and spares for the Cheetah c550? View the full range here. 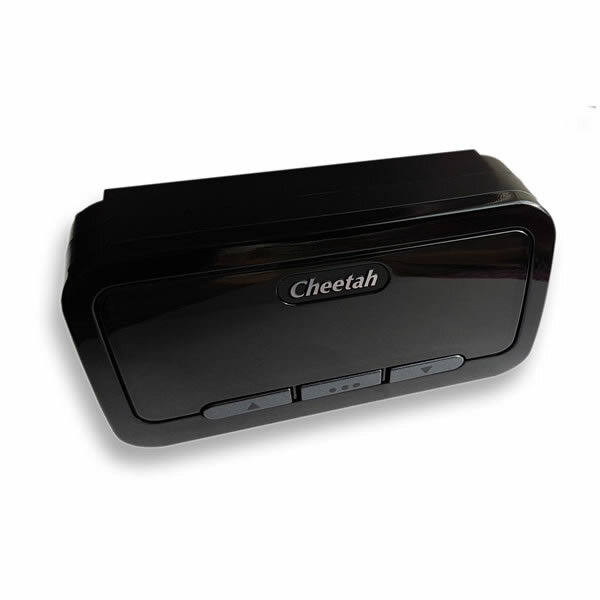 All parts are genuine Cheetah product and specifically designed for use with the Cheetah c550 GPS speed camera detector. Parts include a 2 metre Hardwire Power Cable, a 5 Metre External GPS Antenna and replacement Magentic Dashboard Mount and Windscreen Mounting Bracket. Question: Is the Cheetah legal in Italy and Switzerland? Answer: We are based in the UK, and while we can confirm that the Cheetah c550 is fully legal to use on UK roads. We do not know the legality for other European countries. I would therefore recommend that you contact the Police in both Italy and Switzerland to enquire whether GPS only speed camera warning devices are legal to own and operate. Certainly, the Cheetah c550 Trinity database includes speed camera locations for both Italy and Switzerland. Question: Does the c550 pick up mobile radar van traps and mobile guns? Also, I recently purchased a cheap detector and goes off continuously with traffic lights etc. Does the Cheetah go off at all traffic lights? Answer: The Cheetah c550 does NOT feature a radar or laser detector. 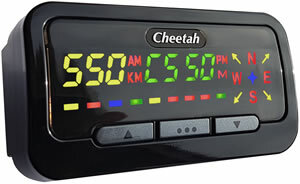 All of the Cheetah c550 alerts are derived exclusively via the units internal and updatable GPS based speed camera database (subscription charges apply). The Cheetah c550 database features both fixed and mobile speed camera locations. It sounds like the speed camera detector you bought features a radar detector. 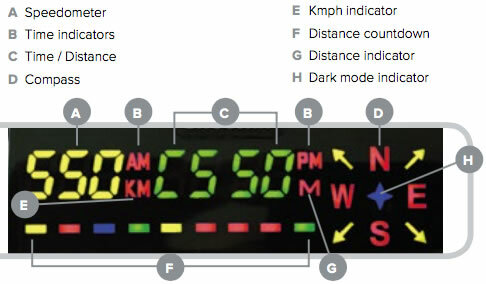 A radar detector detects K band frequency among others. Any device using K band will be alerted to and detected by a radar based detector. This can include; over-speed speed limit advisory signs, shop doorway sensors e.g. automatic doors on petrol station forecourts, traffic light signals, etc. The Cheetah c550, which took the Best Buy award in Auto Express in 2016 will NOT provide any false alerts. If the fixed or mobile speed camera location is in the database, the unit will alert and warn you. If the location is not in the database, you won't receive any warning, thus eliminating annoying false alerts. Do you have a question about the Cheetah c550? Submit your question via our contact page.